SO! YOU WANT TO NAME AN ORCHID AFTER AUNT ETHEL by Hans Proebsting. 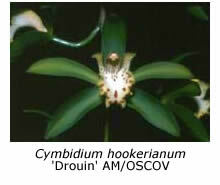 New species of orchids are continually being discovered and described worldwide, including here in Australia. 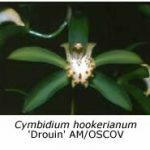 The botanist who first publishes the description of a newly discovered plant generally gets the naming rights. What you need to do is locate such a botanist and convince him/her that aunt Ethel is worthy of having a plant named after her. If you were to discover a new species yourself, that could also work (yes, hobbyists have been known to discover new species). You might then end up with a newly discovered plant being named Chiloglottis ethelae, or Dendrobium ethelianum. Orchid hybrids are registered with the Orchid Registrar of the Royal Horticultural Society (in Britain). If you produce a hybrid that has not been previously registered, you can apply for registration of that hybrid under a name of your choosing (with a few limitations). For example, if you crossed two cymbidiums and successfully produced some seedlings, and that particular hybrid had not previously been registered, you could apply to have it registered as Cymbidium Aunt Ethel, or Cymbidium Memoria Aunt Ethel if she were a dearly departed aunt. In this instance, you could not use plain Cymbidium Ethel, because a hybrid with that name has already been registered. It often happens that hybridisers don’t get around to naming all the crosses they produce. If you come across such a plant, you can apply to have the hybrid registered with a name of your choosing, provided you have the permission of the breeder to do so. With hybrid names, any plants produced using the same cross that you registered will carry the same name regardless of when, where or by whom they are grown. This method is probably the easiest for the hobbyist. Each seedling is unique, and is entitled to carry a name to distinguish it from other seedlings of the same cross. When buying these from a grower or distributor, this individual name will normally not have been applied, and you can select one of your own choosing. Often these seedlings will have only the names of their parents on the tag. For example, if you were to buy a seedling of Paphiopedilum (Chrysostom x Lucifer), you would first need to determine the registered name of that cross, which in this case is Paphiopedilum Dark Angel. You can now name your seedling Paphiopedilum Dark Angel ‘Aunt Ethel’ to distinguish it from all other seedlings of Paphiopedilum Dark Angel. You can do this yourself … there is no need to register the name with anyone. At this point, there will be only one plant with that name, but, if at some later stage you are able to divide the plant, or produce clones from it, then all the divisions and clones will carry the same name.